Stephen Harper did not win a majority in the last federal election and guess who he blames? This is the conclusion we can reach from his decision to abolish the public funding of political parties and the unprecedented constitutional crisis that is resulting from it. It’s absolutely true, by the way. If it wasn’t for the Québécois, who insist on voting Bloc and Liberal, the Conservative party would have a comfortable majority in the House of Commons right now. It’s also true that if it wasn’t for the taxpayer money these parties receive from the federal government, the Conservatives could have easily outspent both of them in the last election. Harper is factually right just as Jacques Parizeau’s infamous “money and ethnic votes” comment was factually solid: If it hadn’t been for the Anglo vote and federal money today Québec would be an independent country. If it hadn’t been for the French vote and public funding of political parties, today Canada would be the Conservative beacon of the Western world. ” We, the taxpayers of Canada, are underwriting 86% of the expenses of a party whose sole raison d’etre is the destruction of the country. Let them work their treason on their own dime”, wrote Andrew Coyne on his Maclean’s blog about the Bloc québécois. This is the party line that continues to be diligently copy/pasted by conservative pundits accross the country. We, the taxpayers are also separatists, by the way. Bloc voters pay taxes to Ottawa just the same as Conservative voters. The Bloc’s 1,95$ per vote is our ‘own dime’, Andy. It doesn’t matter if the Bloc gets 10%, 30%, 60% or 86% of it’s funding from the federal government. 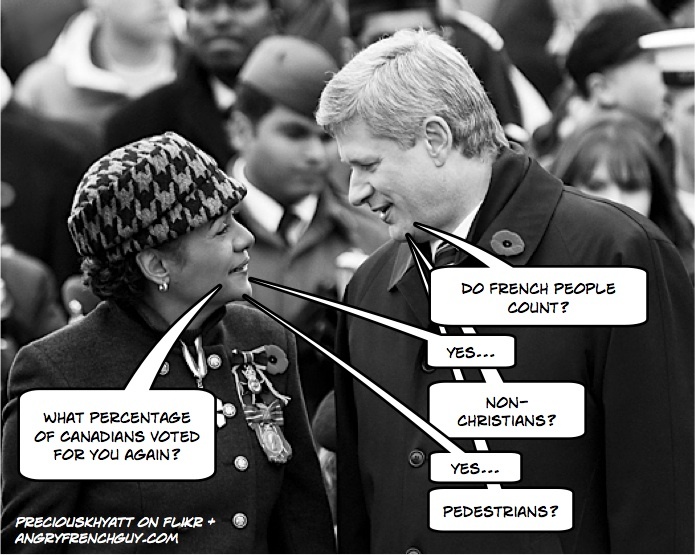 They get their twoonie per vote the same as everybody else. That twoonie comes out of it’s supporters pockets through their taxes. Period. Jacques Parizeau was straight out offensive in the way he blamed the referendum defeat on one segment of Québec’s population. But Jacques Parizeau never called Anglos traitors. He never said they had destroyed the country of Québec, even though a clear majority of Francophones had voted for independence. He certainly never cut the funding of Anglo organizations and political parties, even after it became widely known they had illegally used millions of federal tax dollars to thwart the democratic expression of the will of the voters. These are awfully dangerous times for English Canada to return to the Oka Crisis-style politics of ethnicity and Québec-bashing. An economic meltdown. A constitutional crisis. And now a coordinated campaign by the Canadian Right to blame the whole thing on Canada’s historical scapegoat: Québec. Update: The Tories back down on the public financing of political parties but the Liberals are still talking coalition. In 1988, just before South Africa’s Apartheid regime was about to expire its last foul breath, an antiapartheid organization called the South African Council for Higher Education put out a small comic book designed to help young black children to learn English. The book was immediately banned by the all-white ruling minority. Were blacks forbidden to learn English under Apartheid? Quite the contrary. English and Afrikaans, the languages of the white minority, were the sole official languages of South Africa in those days while the languages spoken by the black majority had no legal status. English and Afrikaans were the languages of government, public services and of secondary education, even for blacks. The novel on which the comic book was based, Down Second Avenue by the exiled South African writer Ezekial Mphahlele, had been freely available in South Africa for three decades. Even the comic book version of the author’s account of his youth in violent and racist Pretoria had been published before. Young blacks were taught English during Apartheid, but they were taught using textbooks from England about white preppy boys in London. Books that perpetuated the image of English as the language of power, and the corollary, that power rightfully belonged to the English. Their reality: black, multilingual and poor was foreign. Defective. Down Second Avenue: The comic turned that on its head. It taught Blacks the language of power so they could use it to discuss their reality and to empower themselves. They could even use English, as other textbooks eventually did, to teach you black kids about the multilingual reality of Africa and the importance of protecting and empowering African languages. This is where Pauline Marois comes in. 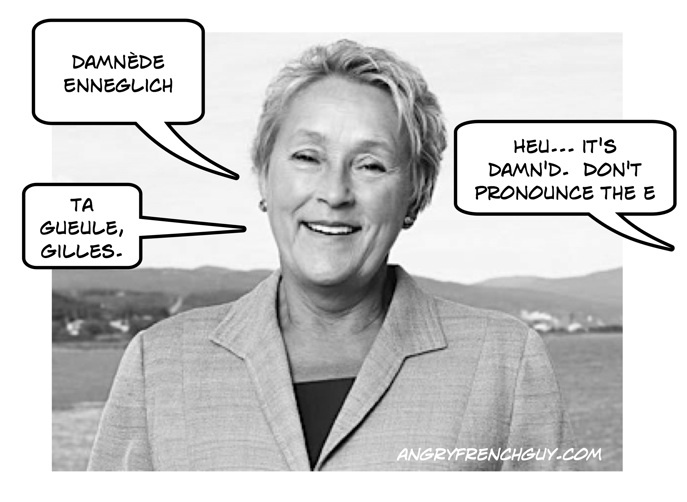 Ignoring the extremely violent opposition from a certain wing of the Parti Québécois and the even more hysterical cries of madness from the Federalist A-list – who seem to share a belief that almighty English will destroy Québec and must at all costs be kept out of the hands of common people – this week Pauline Marois once again proposed that certain classes in Québec high schools, perhaps history, geography or even math, be taught in English. This is (almost) a brilliant idea. Parents have been demanding better English classes and immersion and this is a very positive step, especially for families in the regions who don’t have as much exposure to English as Montrealers. But Pauline Marois’ truly revolutionary idea, which is also the most controversial, is her twice repeated suggestion that History, be thought in English. Her not-so-great idea is to teach math in English. Why is it a good idea to teach History in the international language of science and not math? Precisely because we would spontaneously have it the other way around. Currently, History is taught in French. French becomes the language of the past, of our heritage, of the Plains of Abraham defeat and the failed referendums. English on the other hand is taught as a second language necessary for travel, technology, modernity and international fraternity (as it is always naively portrayed in US and Western-made textbooks). With Marois’ proposal, English would become the language used to explore the past of French-Canadians, but also their successes, the Quiet Revolution and the ongoing struggle to protect French-language culture in North America. Geography class would become a place to discuss, in English, the linguistic and cultural diversity of planet Earth and the international vitality of the Francophonie, a language that as never had more speakers than it has today. All this without threatening the overall predominance of the language of Joseph-Armand Bombardier in all other subjects, including the all important sciences. Teaching History in English would significantly improve the access of Québec kids to English without making them captive of the stereotype that reduces French to the status of heritage language while making English the only language of the modern world outside. The South African comic book simultaneously helped blacks learn the language of power, but also exposed how that language was a tool of their oppression. In the same way, teaching History and geography in English would give Québec kids access to the international language of business and scholarship, but also some perspective on where Québec belongs in this global multilingual world. If English really is the magic amulet that automatically opens the doors of modernity, technology and wealth, then why aren’t the Philippines the richest country in Asia? And why isn’t Japan the poorest? My friend Vince is one of those prototypical couch jocks who’s whole lives revolve around NFL football, hockey playoffs and three-day NHL ’08 marathons. Amazingly, Vince also finds time to get some work done between his ultra-realistic and complex online baseball league simulations. He’s a very successful disc jockey who’s been rocking dancefloors since way before he was legally allowed to even be in the clubs. Since last May, however, some bad vibes have been drifting up to his happy place. Nothing major. Just a very persistent controversy about the amount of French and Québec music that is being played at the Bell Center. The debate started with an online petition by publisher Michel Brûlé demanding that the Bell Center respect the CRTC requirements imposed on French commercial radio stations and play at least 65% of French music. The Bell Center is a private business, not a broadcaster and that idea got very little support. The debate about the amount of French music and local artists played at the Bell Center, however, lived on and today, just like Bob Gainey, Carbo and the guys on the ice, Vince is discovering the joy of hearing people second guessing how he does his job on TV and in the papers. Vince is very lucky to have his job, but he absolutely deserves it. Before he was drafted by the Canadiens, he was the Expo’s DJ at the Olympic stadium. Not many people know this, but before hockey games on Saturday nights Vince is at the Université de Montréal stadium playing music for the college football team Les Carabins. He doesn’t need the money. They can’t afford him anyway. Vince is just really intense about sports and music. Ever since Vince first appeared at our school in the fourth grade with his strange and cool breakdance LPs under his arm, it’s always been about the music, and the music could only be about what we were, French-speaking kids from this place called Québec. Singing in English or changing your accent made you a poser and earned you our sincere contempt. Vince led the way for the rest of us white kids into the then-scary world of Rap or deep into his dad’s collection of old Offenbach, Harmonium and Charlebois records. He can say he’s battled Kool Rock of the first ever Québec Rap crew Mouvement Rap Francophone (coolest band logo in Québec music history) way back when you and your dad wouldn’t even acknowledge Hip Hop as music yet. 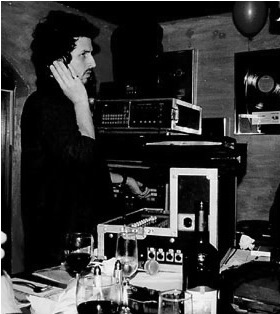 Fifteen years before the Cowboy Fringants, Vince played the drums for for Trad Rock band les Pères Verts, and wrote the lyrics for their nationalist anthem Racines (Roots). Later, with his band Phénomen, Vince recorded two crazy eclectic albums, one of which was nominated as best Hip Hop album at the Gala de l’Adisq, the Québec equivalent of the Grammy’s. Speaking of the Gala de l’Adisq, this year’s edition was held last sunday at, precisely, the Bell Center and I watched the gala with Vince at his house. He’s not going to like me telling you this, but when Luc Plamondon payed homage to Québec’s most successful artist ever, recalling Céline Dion’s rise from Charlemagne to worldwide stardom, her sincere loyalty to the Québec public and how she never stopped recording in French, Vince cried. A few minutes later another legend, Claude Dubois (the guy the CBC edited out of it’s broadcast of the Canadian Songwriters Hall of Fame along with all the other francophones artists) sang Si Dieu Existe. Vince cried again. I very seriously doubt that in it’s 100 year history the Montreal Canadien has ever had an employee who is more passionate about Québec music and culture. The average hockey fan watching the game on TV, however, doesn’t actually hear much of the music played at the arena. The “music” during the game is really just a quick succession of 5 and 10 second snippets: “We will, we will, Rock You!”, hand claps, an organ riff and face off. If you listen to any sports event from anywhere in the world, you will quickly notice there is a very small cannon everyone seems to be working with: Gary Glitter’s Rock and Roll part two, I Love Rock and Roll by Joan Jett and… that’s about it. And let’s hope they keep doing it and keep putting out high impact rocking anthems Vince can play during Hockey games. If they can come up with the beats and the chants, they’ve got a very good friend up there.